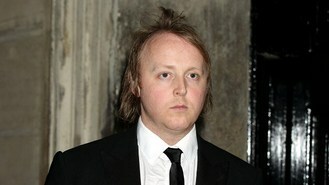 Sir Paul McCartney's musician son said he would be "happy" to form a new band with the sons of the other three Beatles. James McCartney said the idea had been discussed with Sean Lennon, Dhani Harrison and Ringo Starr's son Zak Starkey, but it was more likely another of Starr's sons, Jason, would be involved. He told the BBC: "I don't think it's something that Zak wants to do. Maybe Jason would want to do it. I'd be up for it. Sean seemed to be into it, Dhani seemed to be into it. I'd be happy to do it." Asked if he thought it would ever happen, he said: "Yeah, hopefully, naturally. I don't know, you'd have to wait and see. The will of God, nature's support, I guess. So yeah, maybe." James has released two digital-only EPs and a two-disc set produced by his famous father and is currently on a small tour of the UK and Ireland. Kylie Minogue managed to forget the words to her number two hit Give Me Just A Little More Time at London's Hammersmith Apollo as the UK leg of her Anti Tour drew to a close. Louis Walsh has reportedly hit back at Cheryl Cole after she accused him of taking cheques despite "zero involvement" during the beginning of her career. Paloma Faith, Cerys Matthews and Ana Matronic will be helping the celebrity coaches mentor their acts on The Voice, according to reports. A Burger King advert featuring Mary J Blige singing about chicken has been pulled. X Factor judge Gary Barlow and The Voice star Jessie J will put aside their talent show rivalry to perform live at an awards ceremony next month. Karl Lagerfeld is rumoured to have sent Adele a peace offering to apologise for insulting her.